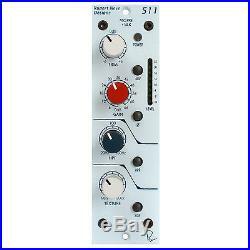 Rupert Neve Designs 511 500 Series Mic Pre with Silk. With a truly legendary transformer-balanced preamp and the flexibility of variable Silk / Texture, the 511 was designed by Rupert Neve to provide classic sonic performance with 500-series value. Incorporating the pristine preamp circuitry from the 517, the universally useful sweepable high pass filter from the 5012, and the sweetness of the variable Silk circuit derived from our flagship Portico II Channel, the 511 is a workhorse for all your most important tracks. A 12-way precision rotary switch controls gain from 0 to 66 dB in 6 dB steps. Continuously variable +/-6 dB level control. Engages phantom power on the microphone input, as supplied by the 500 series rack. Push button inverts the polarity of the signal path, and illuminates when engaged. The symbol "Ø" is often used to denote opposite polarity. The high pass filter is continuously variable from 20-250Hz and engaged by the HPF switch, which illuminates when engaged. It is a valuable aid in any signal chain, but particularly so in a microphone preamplifier. Red Silk accentuates the saturation in the mid and high frequencies, similar to that of the red silk mode on the Portico II Channel. By manipulating the Texture control, the amount of Silk can be changed from essentially absent, to roughly 10 times the amount of coloration / distortion found in Silk from the original Portico Series. With Silk / Texture engaged, the distortion characteristic and harmonic content of the unit are very reminiscent of many of Rupert's class-A vintage designs. An Eight-segment LED bar-graph meter displays output level (pre-Silk). The color range proceeds from green for lower level signals, yellow for intermediate signals, and red for high levels. When the 511 is clipped, the highest red LED will hold longer depending on how far above the clip threshold the signal was. THE MOST COMPLETE MUSIC STORE IN THE WORLD. The Most Complete Music Store In The World, Period. BEST OFFERS - Please submit offers directly using the "make an offer" button. We will consider your offer as soon as it is received. We will then either accept, decline, or counter accordingly. Please do not send a message or call Alto Music in regards to best offers. If a specific listing of ours does not include the "make an offer" button, we are then currently not accepting anything less than the BIN price for that particular item. Merchandise and packaging MUST be in the same condition as when received. Alto Music reserves the right to refuse any return if it appears the item has been used. There are no warranties for the following items: Strings Drumheads Drum Sticks. The item "Rupert Neve Designs 511 500 Series Mic Pre with Silk" is in sale since Tuesday, September 01, 2015. This item is in the category "Musical Instruments & Gear\Pro Audio Equipment\Preamps & Channel Strips". The seller is "altomusic" and is located in Middletown, New York. This item can be shipped to United States.